All for one and one for all! 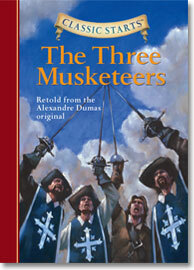 That’s the rallying cry of the Musketeers—guards of the French King—and the call to adventure for young readers enjoying their first taste of Dumas’ classic swashbuckler. Aramis, Athos, Porthos, and the not-quite-yet Musketeer D’Artagnan use their wits and their swords to battle an evil Cardinal, the traitorous Milady, and other enemies of the French court.